Abandoned debuts tonight on Nat Geo at 9 p.m. Eastern, airing its first two episodes. In one of his stand-up routines, the great George Carlin hypothesized that the whole meaning of life is trying to find a place for all your stuff. And given the vast crop of shows that revolve around hunting, analyzing, buying, and selling all flavors of stuff, it’s hard to to find evidence that he was wrong. Much as there’s every different kind of item, there’s also a strong variety in the approach those shows take to acquiring said items. Storage Wars and Pawn Stars embrace the mercenary approach, where the focus is first and foremost on the profit potential of the items featured. Other shows, like American Pickers or America’s Lost Treasures, de-emphasize economics in favor of history, unearthing the stories surrounding items that have been buried for years or even decades. Nat Geo’s Abandoned falls into the latter category of stuff-oriented programming, a show where the focus is as much on the hunt for the treasure as it is on the treasures themselves. This time, the hunt’s being taken into condemned buildings, looking specifically for old furniture, fittings, and relics that may have lain dormant for months, years or even decades. As the show’s host Jay Chaikin says, the act of delving is personal to him, about “whatever it takes to save a piece of American history.” An admirable goal to be sure, but there’s a lot of history being saved these days, and Abandoned’s approach to the process is a fairly routine one. From the first couple of installments, it’s obvious that Abandoned has a formula clearly in mind. Jay and his team —childhood friend Dan Graham and new recruit Mark Pakenas—enter the building and fan out for the search for antique benches, lighting fixtures, stained-glass windows, and other objects of desire, pairing their investigations with a history lesson on the items (complete with pop-up facts) and calling in an expert as necessary. From there, it’s negotiation with the building’s owners for whatever items they’ve identified as having potential (or negotiation with Jay’s wife Ricki back at the home office, who sets the cap on how much they can spend). And in the last few minutes there’s some time back at the shop as Jay’s team works to restore or convert some of the purchased treasures—a work cart renovated into a leather armchair, for instance, or vintage gas lamps polished to a mirror shine. One of the downsides of the proliferation of shows about the exchange of stuff means that, from the outset, a show like Abandoned is going to feel incredibly familiar. And while it’s not bad in any conventional sense, the biggest problem with the latest variation on the theme is that it doesn’t do much in the early going to distinguish itself. There’s certainly nothing wrong with following a successful formula, but there’s little energy to the picking or to the dealing. The property owners in the initial two installments don’t quite have the history with the buildings one would hope for, and once a deal is struck, the rest of the sales tend to zip past. There are also glimmers of aspects the show could spend more time on—the closing minutes in Jay’s shop have hints of an American Restoration-type approach to the business, but the details of the work done are too scarce to be intriguing. It doesn’t help that the show’s ensemble lacks the energy of other examples in the genre, with no equivalent of a Barry Weiss or Chumlee to liven things up. 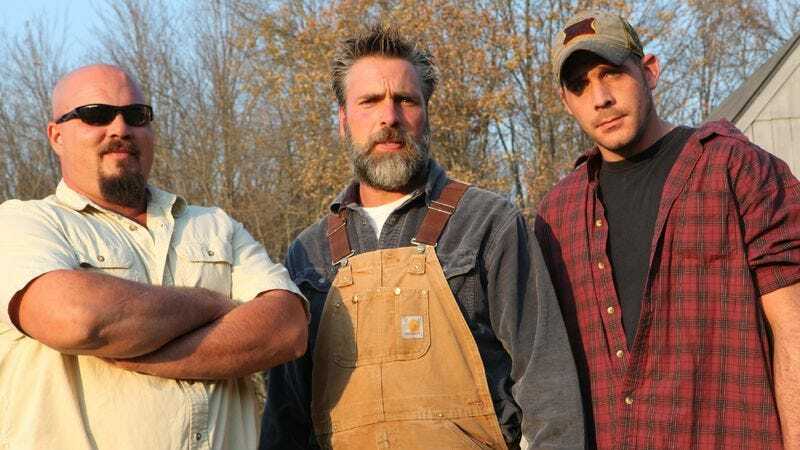 As often happens in the early goings for shows in this genre, the three members of the team aren’t as comfortable in front of a camera as they are digging through a pile of rusted machinery, and there’s less banter and more quiet mutterings about the value of certain items. There’s a relatively entertaining “roasting the new guy” dynamic as Jay and Dan push Mark into doing the more menial work, or a joke where Jay takes advantage of Mark’s fear of bats, but it’s still muted in the execution. More dynamic—if predictable—is Ricki’s role back at the office, where she frustrates Jay’s bigger ambitions by keeping his spending in check or claiming a restored item for herself. Where Abandoned stands out from the pack is in its settings, as Jay’s team and the producers clearly do their homework in finding just the right locations to pick through. The first episode goes to a Maryland silk factory that shuttered after a 1950s strike and never reopened, and the second visits a Gothic church in the heart of Philadelphia slated for demolition in the next 60 days. As a consequence, there’s a more claustrophobic air to the show, a definite sense of timelessness to the locations, and layers of dust and debris that don’t feel in any way artificial. At times, these two episodes even approach the aesthetic of a horror movie. The age of its subjects also helps dismiss some of the more unseemly attitude that hangs over some programs of this ilk, as the current owners of the buildings don’t feel as if they have any more ownership of the contents than Jay and his crew do. They’re simply tending something long forgotten. And that angle might be enough to cut Abandoned some slack in the early going. Much like scripted shows, few of these antique-centered reality series have their particular chemistry nailed in the early episodes, and there’s certainly a chance the team will find a sense of fun the longer they get to play to an audience. Yes, there’s a lot of this kind of programming out there today, but there wouldn’t be so much if there wasn’t an audience for it, and the odds are that the audience will make some room in its viewing closet for a little more stuff.